Apple says it stepped up environmental audits of suppliers and found significantly fewer cases of underage labor at its supplier plants last year. The findings were highlighted in Apple’s annual Supplier Responsibility report, which the company released Friday. As part of the report on worker protections and factory conditions, Apple also published a list of its production suppliers—an unprecedented move for a company that tends to keep a tight lid on details about its supply chain. Apple says the list of 156 suppliers represents 97 percent of its procurement expenditures for materials, manufacturing, and assembly of its products around the globe. The release of Apple’s supplier list appears to be prompted by the company joining the Fair Labor Association, a nonprofit organization that targets sweatshop conditions. Apple is the first technology company to join the FLA, which will audit Apple’s supply chain to see how it measure up against the group’s Workplace Code of Conduct. Those results will be published on the FLA website, according to Apple. The Supplier Responsibility report published Friday is the sixth annual look into working conditions and environmental impact at the third-party factories that supply parts and assemble Apple products. This year’s report included 229 audits throughout Apple’s supply chain, an 80 percent increase from the previous report, according to the company. 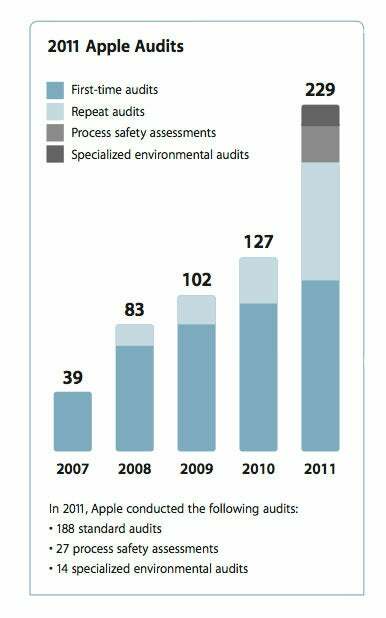 Apple says it also conducted more than 100 first-time audits in 2011 as it expanded its program to go deeper into its supply base and added more specialized looks on safety and the environment. The 27-page report covers four areas regarding Apple suppliers: labor and human rights, worker health and safety, environmental impact, and ethics. The report additionally looks at suppliers’ efforts to set up management systems to keep themselves in compliance with Apple’s code of conduct and their efforts to educate and develop workers. On the labor front, Apple says it broadened its age verification program, which aims to stop underage labor among its suppliers. As a result, the company reported improvements in supplier hiring practices, with cases of underage labor down significantly. The report discloses a total of six active and 13 historical instances of underage labor at five facilities; Apple required those suppliers to improve labor recruitment practices and support underage workers going back to school. The audits found no cases of underage labor at the suppliers responsible for final assembly of Apple’s products. This year, Apple also increased audits in Malaysia and Singapore, looking at 28 suppliers which work with third-party labor agencies to hire contract workers from other countries. In some instances, these labor agencies can charge excessive fees that force workers into debt, which Apple considers involuntary labor. The company’s supplier code limits recruitment fees to the equivalent of one month’s net wages and makes its suppliers pay back overpaid fees to workers. This year, suppliers reimbursed $3.3 million in excess contract worker fees, according to Apple’s report. Apple did stop doing business with one supplier for what it called repeat offenses of involuntary labor. The working conditions section of the Supplier Responsibility Report noted two incidents this year where combustible dust was to blame for explosions at two facilities. The first explosion at a Foxconn factory in Chengdu, China, killed four people and injured 18; a second explosion at a Pegatron subsidiary’s factory in Shanghai injured 59. As a result, Apple says it established new requirements for handling combustible dust throughout its supply chain. Those measures include specific ventilation requirements, comprehensive inspections, and the ban of high-pressure compressed air for cleaning. All but one supplier has implemented these measures, according to Apple; that lone supplier will remain shut down until modifications are in place. In addition to its regular battery of environmental audits, Apple says it conducted specialized audits at 14 suppliers in China, looking at wastewater treatment facilities, air emissions handling, solid waste disposal, and noise abatement systems. The audits, conducted by third-party environmental engineering experts, found a number of violations, which Apple is working to correct with its suppliers. Apple plans to expand the number of specialized environmental audits it conducts, starting with high-risk segments such as printed circuit board manufacturers. The company is also putting a training program into place that boosts awareness of environmental issues among employees and suppliers. In 2012, Apple will require suppliers that represent 90 percent of the company’s final assembly capacity to index their sustainability reports to the Global Reporting Initiative as part of an effort to boost transparency. Apple’s Supplier Responsibility report also looks at the company’s efforts to use conflict-free raw materials, such as tantalum, tin, tungsten, and gold. Apple says it is working with the Electronics Industry Citizenship Coalition and the Global e-Sustainability Initiative to train and certify smelters of these metals. Going forward, Apple plans to require suppliers to source from conflict-free certified smelters. In addition to looking at how Apple’s suppliers adhere to the company’s code of conduct, the annual report details efforts to educate workers at those plants. Such training began with Apple's final manufacturing facilities in 2009 and has steadily gone deeper into the supply chain. Apple says the company has trained 1 million workers at final assembly and component suppliers. The company additionally expanded its Supplier Employee Education and Development program, which offers workers classes in finance, computer skills, and English. The SEED program expanded to all final assembly sites in 2011, with more than 60,000 workers participating in training. Apple’s Supplier Responsibility reports date back to 2007, prompted by allegations of worker abuse at supplier factories. In subsequent years, the company has increased the level of scrutiny it places on its suppliers to ensure that they follow Apple’s supplier code of conduct.